Hi Guys! 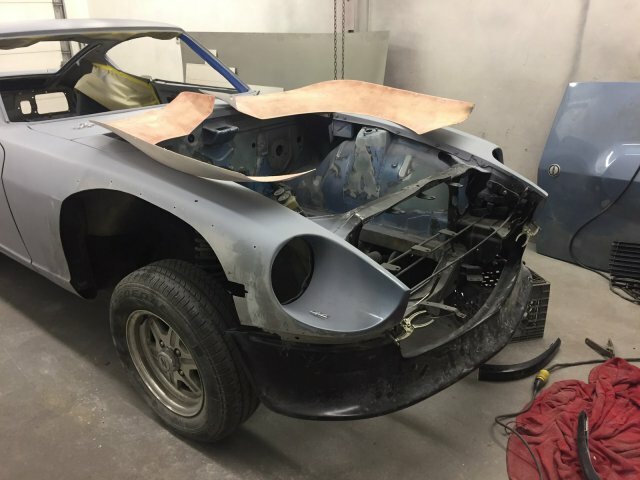 I am not super new to these forums but I also not a pro yet However, as far as I can see no one has posted any pictures or information about the Fiberglass Mafia Flare kit for the 240z, 260z, and 280z! 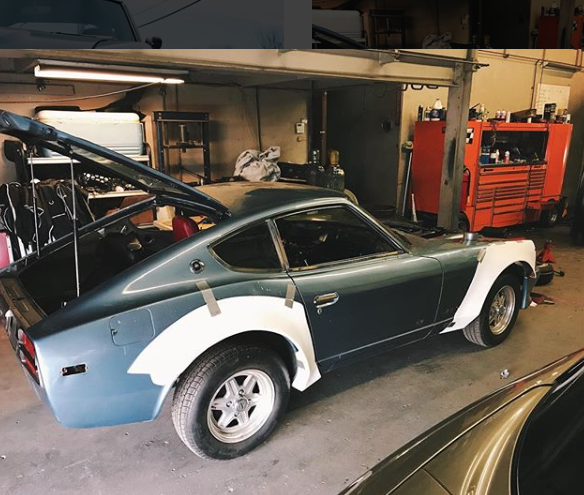 I have been eyeing these fenders for as long as I've owned my Z and since I've had them for a while, it was finally time to send my car to my body work guy! When I first ordered the fenders I was a little wary of the fitment and quality because no one had really reviewed these fenders yet before. Well, here I am! After placing the order, I waited a couple months and then they finally arrived!! As far as I could tell they were pretty sturdy, pretty lightweight and looked like they would be amazing on my Z! Here is a picture of my baby with the fenders taped right on. The first step once my car got to the body shop was to bring down and cut back my original fenders. You could see them underneath the Mafia flares, like a lot! 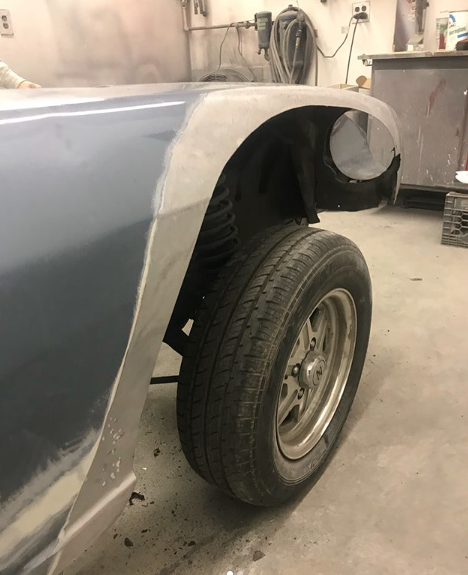 I couldn't imagine not cutting the fenders back because as soon as you were to see the car from a low angle, there were the old fenders underneath! It was horrendous. Here is a picture of how high we had to cut the fronts back. I don't have a picture of the backs cut, but trust me, they're cut!! Next, we fit the fenders on the car and riveted them in place. 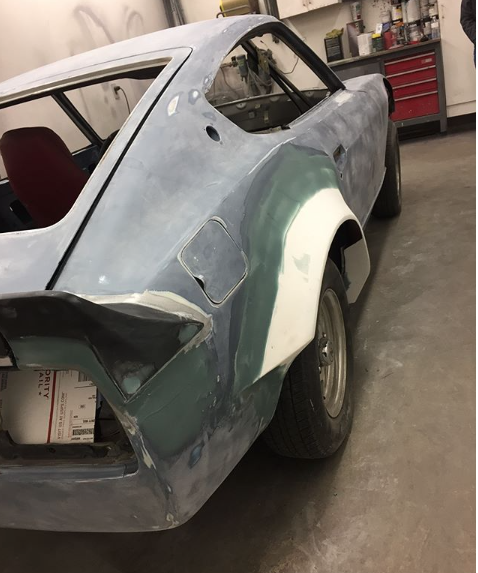 The backs went on pretty easy, mostly all the lines in the fenders went with the body lines of the car. The fronts were a little more difficult to fit, especially matching the little piece that attaches the fenders to the air dam. You can kind of see how that little piece doesn't fit quite right. 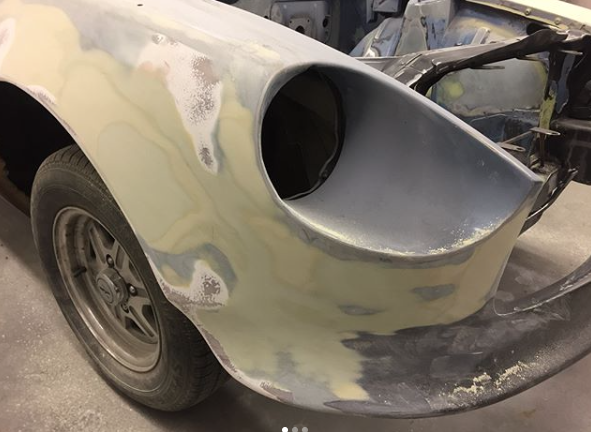 So I went back onto the Fiberglass Mafia instagram page to try and find some more information. I found out that they used the Type 1 Air dam to mold with this kit, and that's exactly what I had! I figured that if I bought a bumper we could see where the air dam wants to sit, and more easily fit the front together. But, you can see how awesome the from fenders line up!! 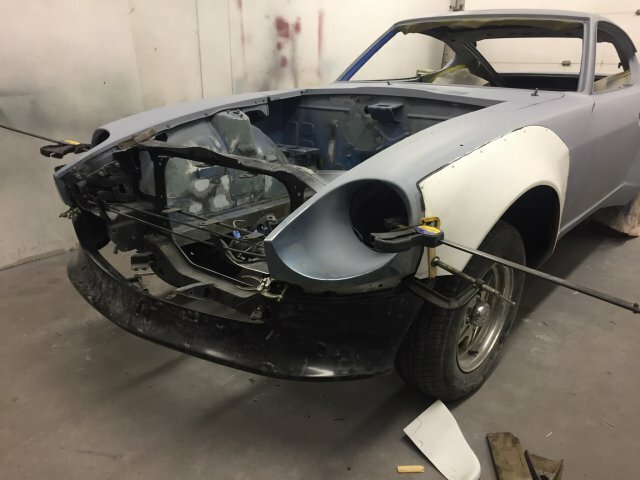 We decided to start working on the backs while we ordered and waited for a new front bumper to ship. I wish I had a couple pictures to describe this next problem we ran into, but I don't! So I'll have to do my best to try and explain it. 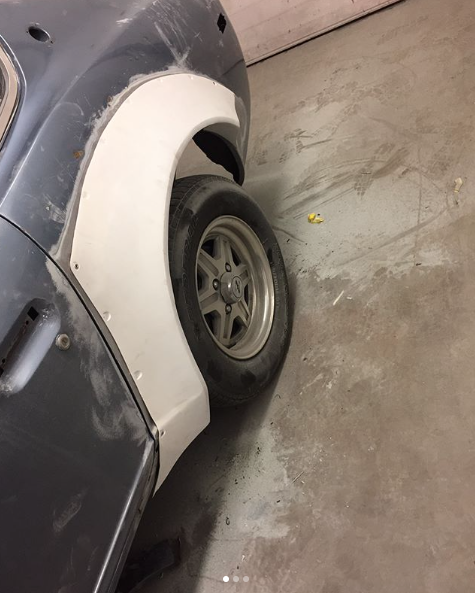 SO, yes we cut the original fenders back, NO you could not see them underneath the mafia flares anymore, HOWEVER, the flares were hollow! 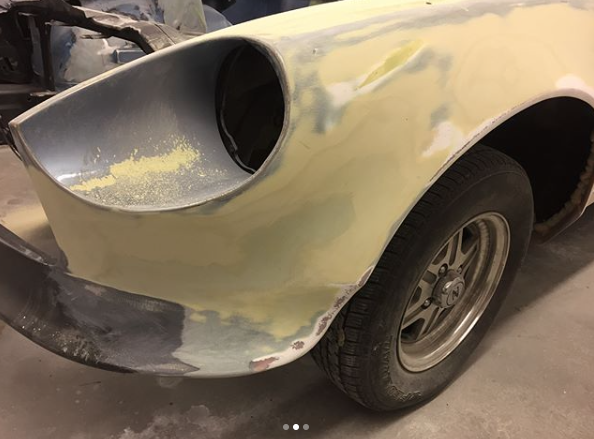 So the flares were only going to be bonded to the upper metal of the car, leaving the underneath completely uncovered and ugly looking! 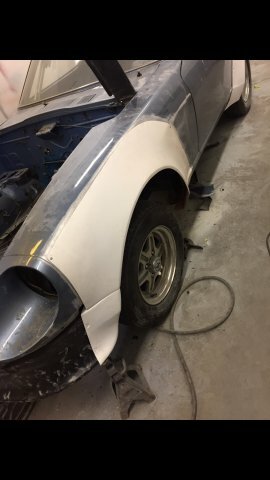 Thankfully, my body guy is quite a body guy and found a way to make the most beautiful custom under fenders! THEY CAME OUT SO WELL! I'll try and get you guys some pictures so you have a better idea what I'm talking about! 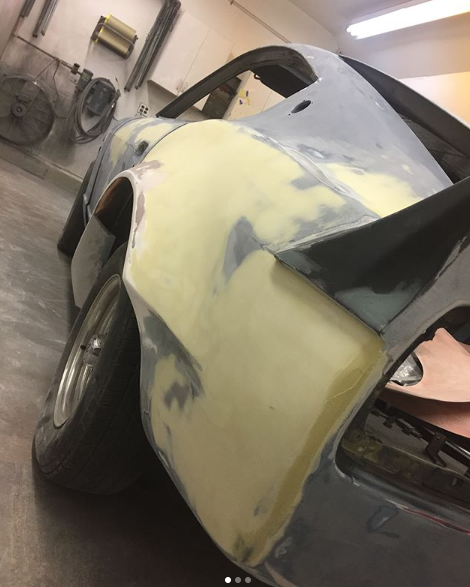 Anyways, back to working on the rears! This is just about where we wanted them, so we riveted them in place and started to bond them to the car. I was SOOO happy with them at this point! However, my plans were to have them molded onto the car so I knew it wouldn't stay looking like this. I was a little scared of having them molded because lots of people expressed their doubts and warnings about having them molded! BUT, I have faith in my body guy!! 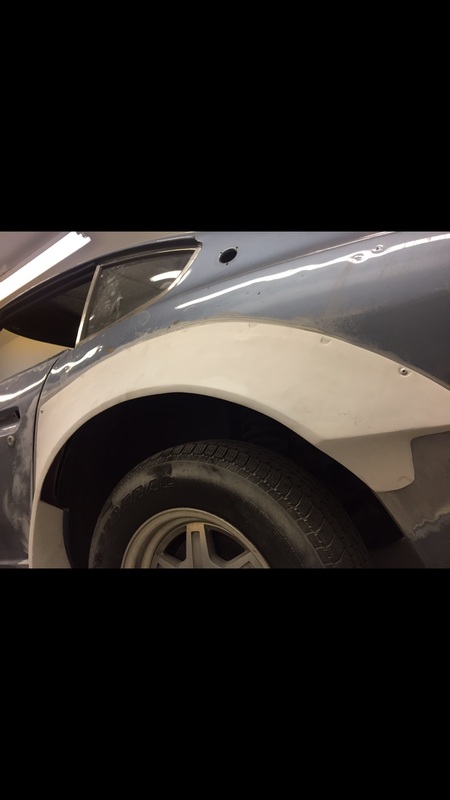 After my fenders were bonded and set, the molding process began! Here is a picture mid way through! When I saw the fenders like this I was definitely excited that work was getting done but I was scared! I was like wow maybe molding wasn't the best plan but oh well! I STILL TRUST IN THE BODY WORK!! A couple days later I saw some more progress and I was SOOO relieved. My car looked completely different and at last I was finally happy I chose to have them molded in! 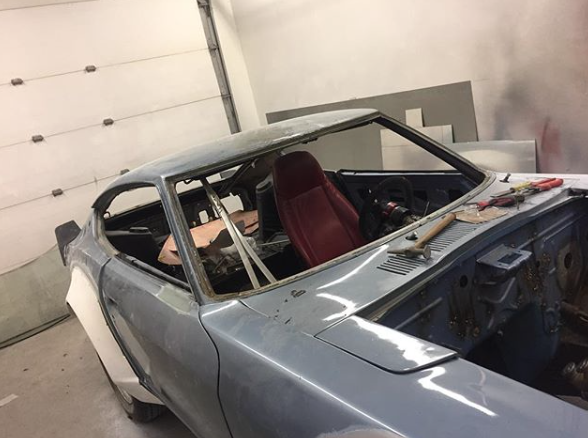 At this point I was beyond excited that I chose the fiberglass mafia kit, everything is coming together so well! OKAY Okay, so before I show you the most beautiful of pictures (the back molded on completely), I'll give you some back story about my car and myself. 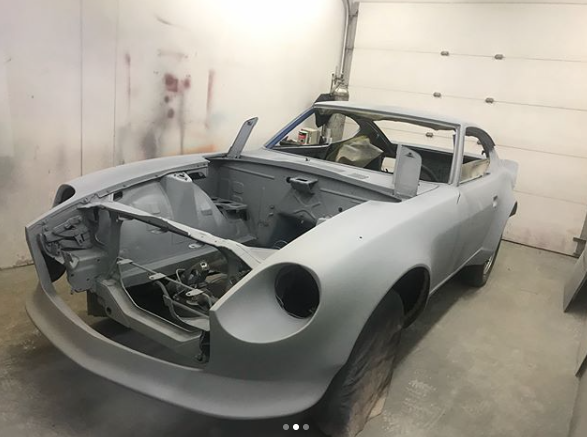 I have another thread going into details about the car build as a total but this is just quick recap! 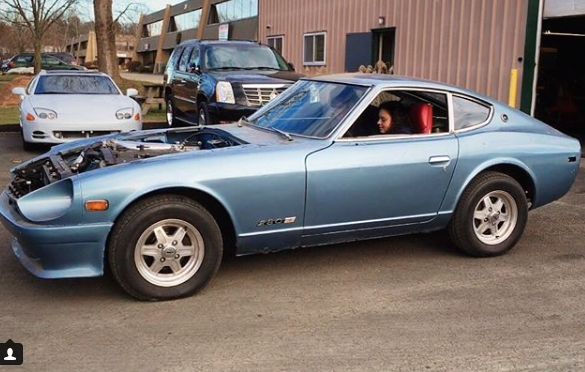 Here's a couple pictures of the car and myself! 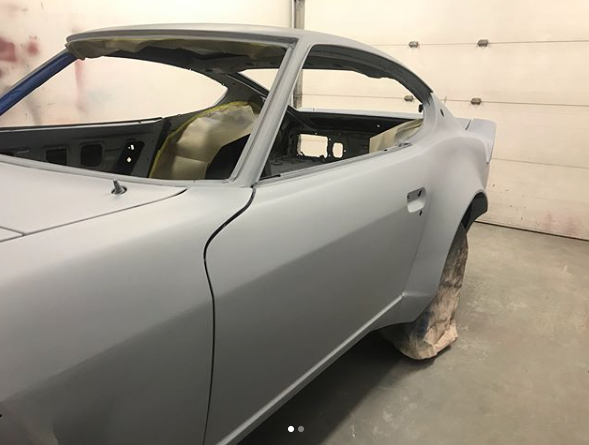 Okay, so last weekend my body guy called and said I should stop by and take a look at my car all one color, with the back fenders molded on, so I can get an idea how its gonna look when its done! LOOK AT THIS BABE! It looks insane!! It got me even more excited for how the fronts are going to come out. 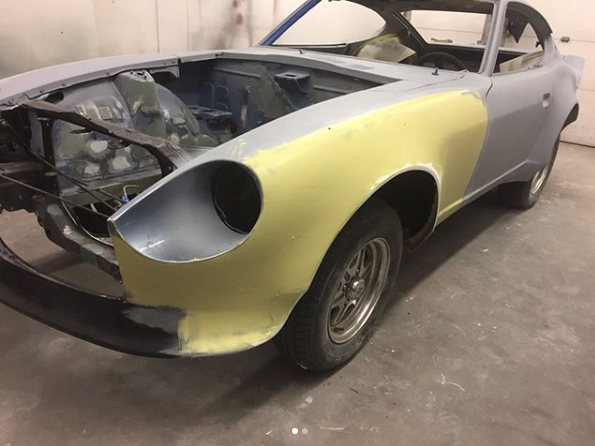 The bumper will be in this Saturday so he can start right away on fitting and molding the fronts. 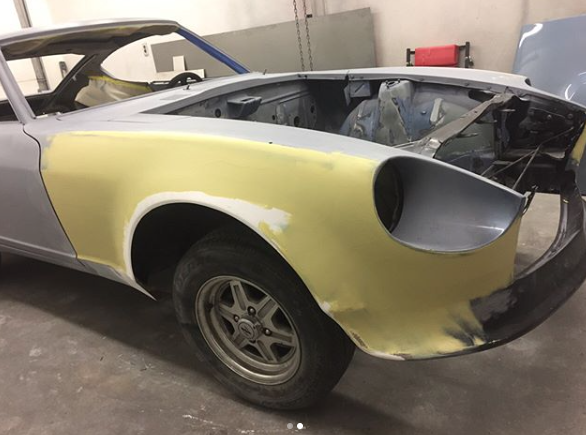 I'm thinking that in about two weeks the car will be completely done, bodywork and paint! I love how the car looks like it came stock with these flares! HOWEVER, I also love feedback, let's hear what you guys think!! It all looks pretty good, trust me, I'm a body guy lol. 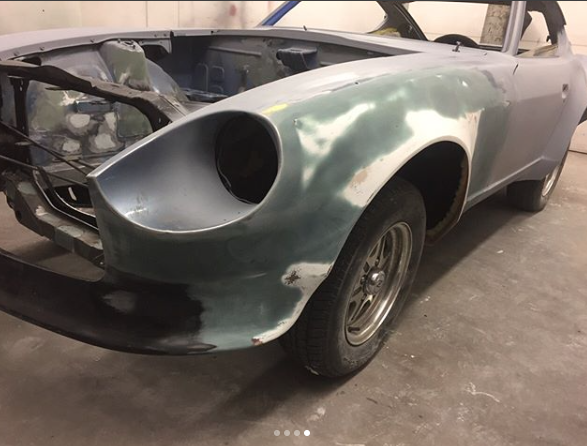 great job on the body work, really enjoy seeing flares blended into the body of the car. Looking to do something similar in the near future, any words of wisdom? Things to avoid or something you might do differently if doing another Z? Thank you, yeah it has been a lot of work and there's still a lot to go! And ugh, words of wisdom. I guess I would say definitely don't be discouraged to do the bodywork your own way. As said before, so many people warned against blending but here they are looking great. I don't know if I would do anything differently just yet, everything is coming out, THANKFULLY, just right! But I will keep you all posted!! Okay, so we have made some more progress! The bumper came in. It turns out it was a little long but we were cutting it up anyways so that didn't matter. Right now we just needed it for spacing the air dam and fenders properly. 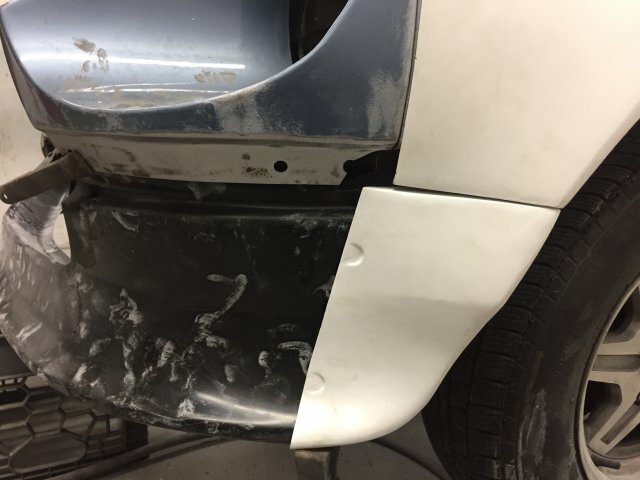 You can see the the bumper on the ground, we cut off the middle of the bumper and decided to just keep the sides. I think it would look pretty sweet like this. I also have seen some other cars with this done to the bumper and I absolutely loved it. Originally we were just going to go off the bumper delete plates made by Skilled but it turned out they were not quite what I was looking for. I didn't like their quality or style for this particular piece. However, I have their grille and it is excellent. Anyways, yes! So we fit the bumper to the air dam and everything spaced out okay. But then, we ran into our next issue. The contouring of the grille did not exactly fit in with the contouring of the bumper, and there was about a 3" gap between the air dam and grille Which AGAIN, I was so surprised by, because on the Skilled site, if I'm not mistaken, they used the Type 1 Air Dam, WHICH WAS WHAT I HAD. I got a FaceTime call from my body guy and he showed me the gap and asked if it was okay to cut my expensive grille and change some things to match the contour of the air dam. Yes it's okay I BELIEVE IN YOU. I'll get some pictures once the grille is cut, painted, and adapted to the air dam. So, the fronts have been fitted and riveted in place and are now bonding and drying as we speak! 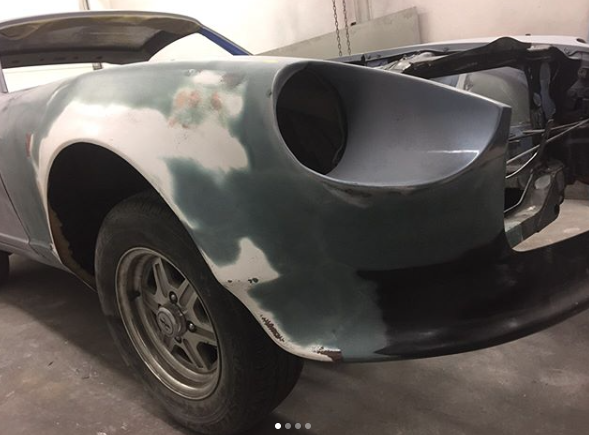 It looks a little crazy with all the mismatched colors but then I thought back to how crazy the backs looked midway through progress and how great they look now. 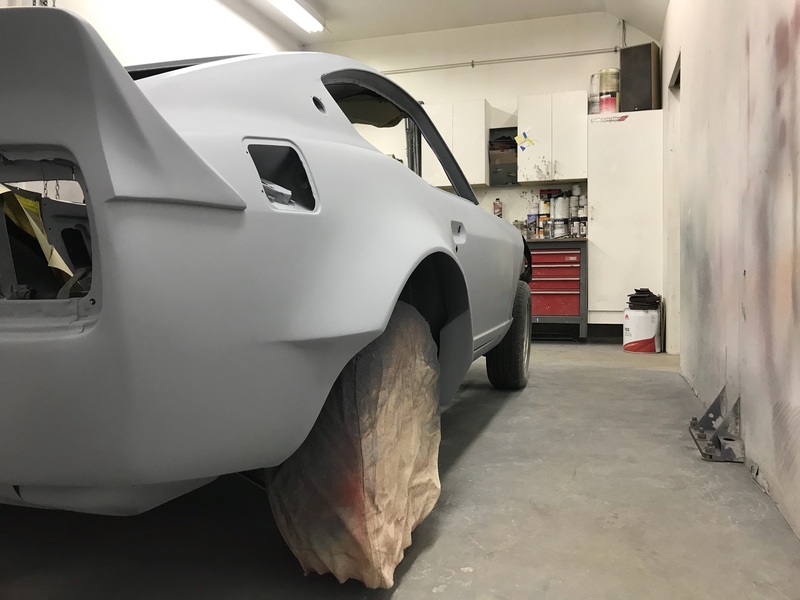 Tonight if they're dry its time to start molding them to the body and molding that little piece going from the bottom of the fender to the top of the bumper. Hey guys, I am back with some more updates! So, last we left off with the fronts riveted in place and leaving to set. Next we started blending the fenders into the body. I was super excited to see how everything was starting to look so smooth! So after I got the last set of pictures, I didn't hear from my body guy for about two weeks. He was slammed at work and I don't blame him for taking some relax time for himself! I am in no immediate rush and he's done such a great job so far, I figured a few weeks off is no biggie. However, then he sent me some more pictures of my baby and I got all excited all over again! He was telling me that he had the most trouble blending in the flare to the little end piece that came with the flare, to the air dam. He explained that they all had different contorts and body lines and to get them to mesh together so clean took some work! HOWEVER, IT LOOKS AWESOME!!! 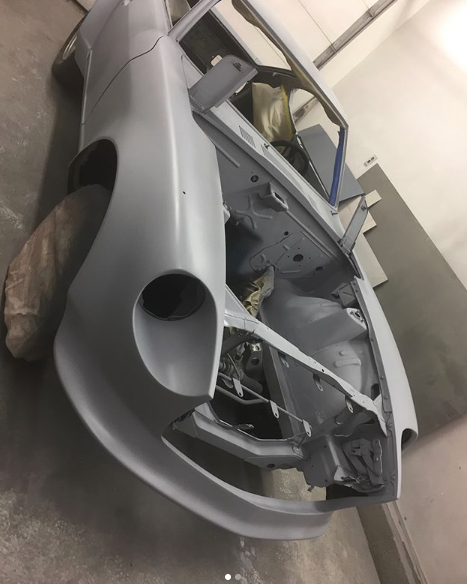 It's starting to look like the front end is all one piece and that is something that I like! 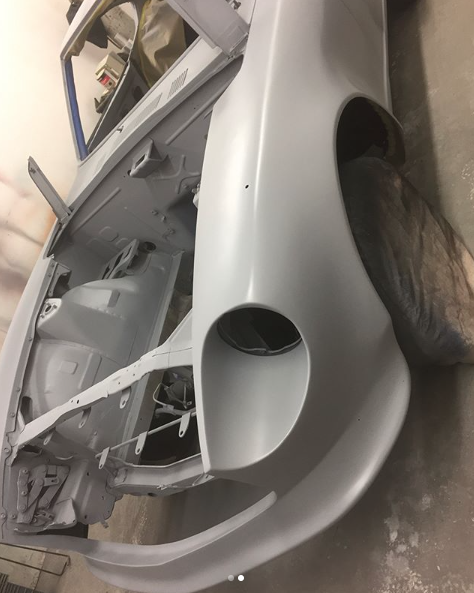 Alright, so after I got the last pictures I was ACHING to see the car all one color! I just wanted to get an idea of how nice the body kit looked without all the colors distracting me! Then, a couple days ago, at around 11pm I got the NICEST text message. 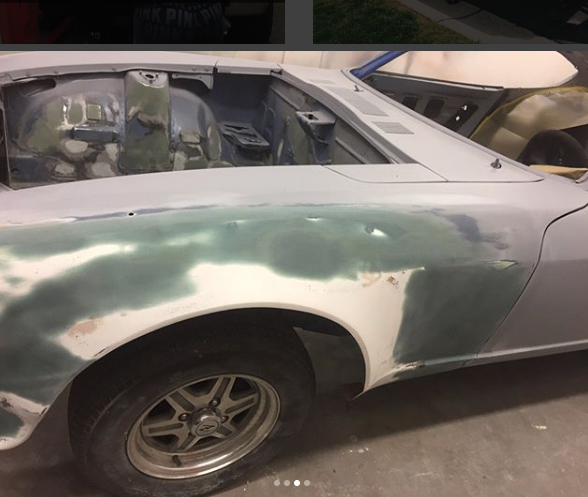 My body guy said he had finished up all the body work and was just about to primer it!! Within an hour or so, I got the coolest pics ever. 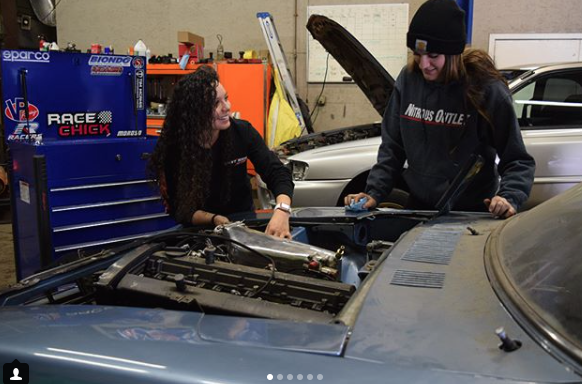 Take a look and see how awesome the car looks! I WAS SOOOO HAPPY. The car looks insane. It looks like the wide body kit came stock on the car and that's exactly what I was going for!! The next night I stopped by to take a look at my baby in person, and let me say, the pictures do not do this car justice! Before this, I was trying to decide whether I liked the look of the car with no bumper, and I do, or if I wanted to add a bumper. I think I decided to put the bumper ends on to give the front end some contrast. I also propped the grille in there just to see how it would all look and DAMN I am psyched!! This is gonna be awesome! 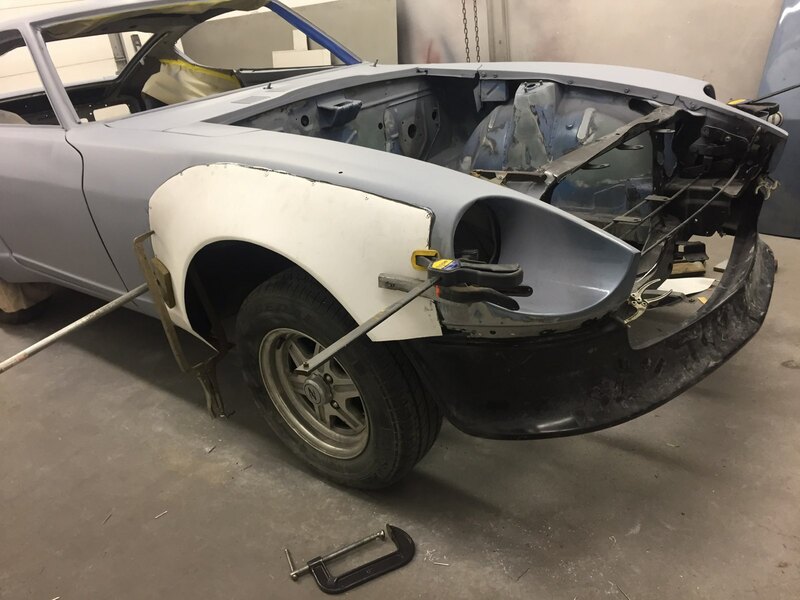 He said the next step is attaching the front bumper ends, either making them permanent or detachable. Either works for me, I trust his judgement! 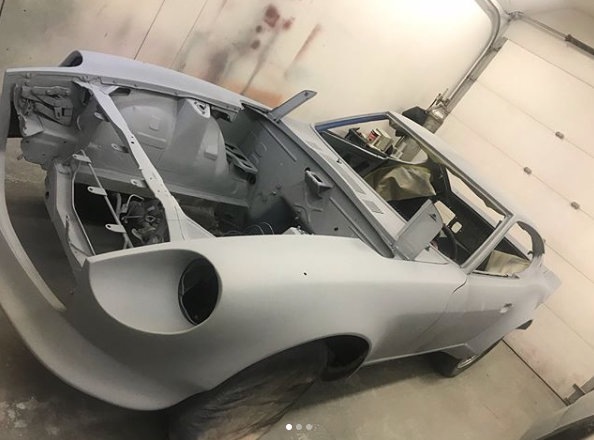 Then he's gonna block sand the car and fill any air bubbles the fiberglass flares have left, then sealing, AND THEN I THINK PAINT!!! 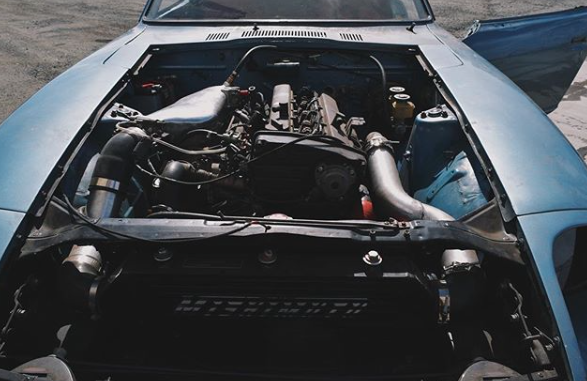 The kit looks like it sits pretty low on the body, curious how it will look all together. Keep up the good work! Despite the reported trouble blending the front of the flare to the air dam, I think it looks amazing. Very nice work there. Thank you I appreciate it! It definitely does sit very low which is kind of what I wanted. I think when the suspension is all finished and tire and wheels are on its gonna look insane! I can't wait to see.